Each year handfuls of Northern Michigan wine festivals and events take place throughout Michigan’s “wine country.” Ranging from weekend-long festivals that feature headlining nationally touring and Northern Michigan musicians to day-long events that celebrate with wine tours and food pairings. These events happen annually throughout Northern Michigan; keep your eye on MyNorthTickets.com for ticketing. 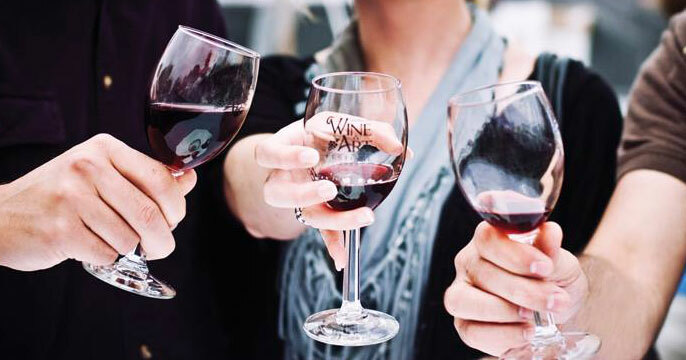 Taste the passion streaming through Leelanau County wineries at this annual celebration of wine, chocolate, and love. Take a tour through numerous wineries and tasting rooms as you enjoy wine and food pairings along with wintery and Valentine-themed activities. Tickets include a signature wine class with a special wine pour and sweet or savory dish at each winery. Tickets are available at MyNorthTickets.com. The pre-event to Leland Wine and Food Festival (see below), Artscape showcases local artists, with judges choosing the winning piece to be used for the following year’s Wine and Food Festival. Sip on wine while you vote for your favorite “People’s Choice” piece of art. This event takes place at the Old Art Building in Leland. Enjoy a day at Leland Harbor near historic Fishtown. Taste award-winning wine, enjoy views of the water and the distant Sleeping Bear Dunes, and munch on delicious specialties from local restaurants and vendors. This event takes place in Leland. Tickets are available at MyNorthTickets.com. This one-day event features numerous musical acts and plenty of wine to sample, all in conjunction with an art show displaying the works of local and regional artists. Held at the Grand Traverse Commons west of downtown Traverse City, the Traverse City Wine & Art Festival is one of the biggest of the season. Held in the park next to the city marina off Front Street, the Waterfront Wine Festival in Harbor Springs brings wine tasting to the water. This waterfront event will also include music, art and more. The Leelanau Peninsula Wine on the Water Festival will feature tastes of Northern Michigan’s wine country as well as distilleries and breweries. This festival also includes food from local restaurants and live music all while taking in the captivating views of the water. This event takes place in Suttons Bay. Held at Traverse City’s Open Space, this food and wine event brings the traditional Spanish dish, paella, to Northern Michigan. Paella and wines from the Old Mission Peninsula will be paired together to create the ultimate food and drink experience. Paella in the Park will also feature live music. This three-day festival highlights the best that Northern Michigan has to offer: world-class wines, food and views. Including multiple individual events, tasters will eat their way across Traverse City. Attend some or all of the events. Start the day with a 5k run/walk or 7-mile run through the rolling hills of Leelanau County. Then, top it off with a self-guided wine tour of Leelanau Peninsula wineries. Or, don’t run and enjoy the wine anyways. Tickets include a souvenir wine glass and special wine pour and food pairing at each participating winery. Tickets are available at MyNorthTickets.com.